Red Dead Redemption II Review – Eggplante! 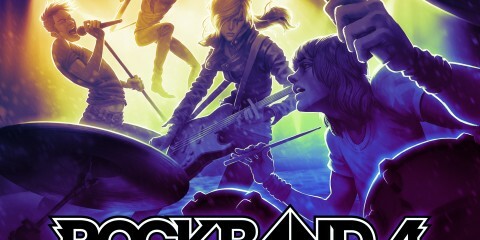 In the middle of May, 2010, Rockstar released a game that has gone on to become one of the most revered titles in existence. 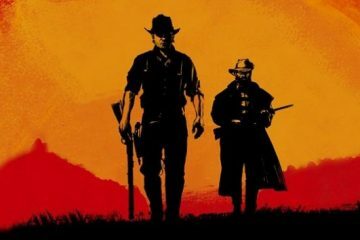 Mixing open world, Grand Theft Auto-esque gameplay with the Wild West, it immersed, addicted and dominated the lives (and tongues) of gamers for quite some time. All of that was for good reason, too, because Red Dead Redemption deserved all of the acclaim it received. It truly was a great game, and something that was much needed given how few Western games happen to exist. 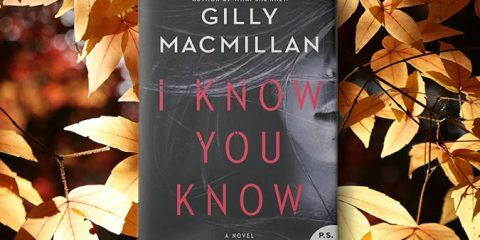 Fast-forward to this fall and, after lots of hoping, waiting and anticipation, a sequel has finally been released. Yes, after more than eight years, including one or two lengthy delays, we are now able to play and enjoy Red Dead Redemption II. A much desired game that had been at the top of many gamers’ want lists for quite some time. 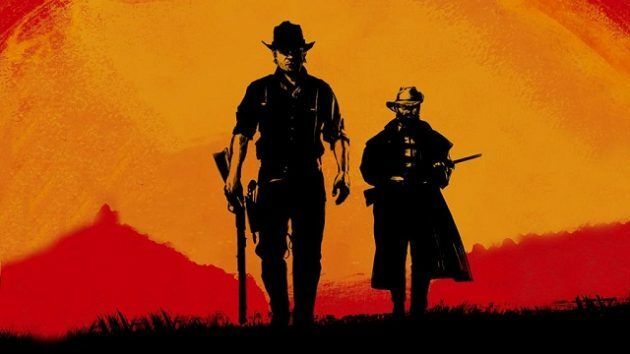 Set in the Wild West of 1899, Red Dead Redemption II centres upon a troubled and not-so-nice man named Arthur Morgan, who just so happens to be in a gang with a younger version of the first game’s John Marston. In fact, the gang that these two men happen to be a part of is quite large, and is comprised of not just nasty men but also women and children. 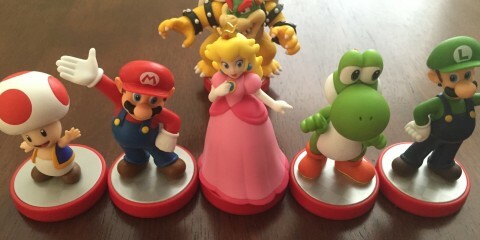 Some are more innocent than others, of course, but the gang works together to serve its common cause. This means sharing a money box, bringing food back to camp for the day’s stew and sharing supplies. This massive and lengthy campaign begins in the mountains, where snow still reigns supreme despite it basically being springtime. It’s here, on these snow covered and elevated rocks, where the gang’s convoy attempts to find shelter for its freezing cold members, including some who are sick or injured. The early conversations that take place during this time also reference a rival gang, whom the player meets not long afterwards. It’s this group of derelicts and murderers who become a main enemy and source of stress, also going as far as to randomly ambush Arthur during his travels. The opening act (of which there are several) is both an introductory and an involved tutorial of sorts. 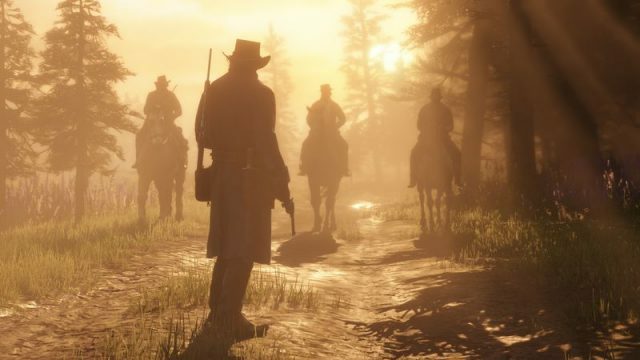 It teaches players the ins and outs of the new Red Dead formula, which has changed some over the years. The end result is a far more realistic game, which takes such things as body temperature, clothing thickness, character stamina and horse stamina into account. Players must also manage their inventory, and grab guns that they wish to use during missions from their horse before leaving it. As was the case with Grand Theft Auto: San Andreas, the main character can lose weight depending on how much or how little he eats, and can also grow hair over time. Thus, players must make sure to purchase, steal, find and carry a good amount of food for themselves, which means visiting general stores, looting locations and hunting. One must also feed their horse, in order to keep good standing between oneself and one’s animal, and to improve the creature’s health and stamina. Reason being is that, if your horse happens to die or lose all of its stamina halfway into a trip, you’ll be a little bit screwed. This is especially true given that, for a horse to regain stamina (without being fed something), it must either rest or be led on foot, which means camping for the night, finding a hotel or doing some walking. Weapons also degrade, meaning that it’s important to take care of the murderous tools that you enjoy using most. This involves cleaning and oiling the weapons, using tools that can be purchased or found. Needless to say, this is a much more realistic and involved take on the formula that was first presented back in 2010. At its heart, though, this is still very much Rockstar’s Red Dead Redemption that many of us fell in love with almost a decade ago. This may be a more realistic take, but it remains an epic, open world Western, wherein a lot of the gameplay is reminiscent of an old timey take on Grand Theft Auto. 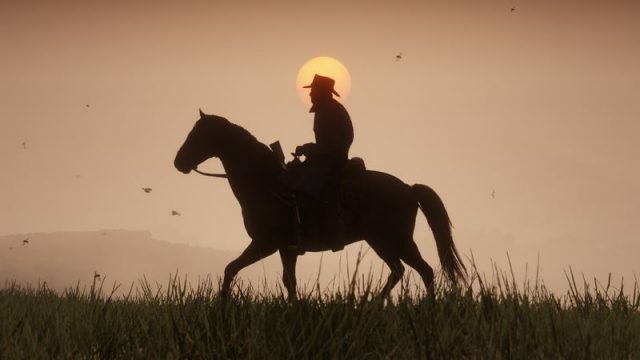 In the years since the first game released, Rockstar has worked on including more choice within its sequel. 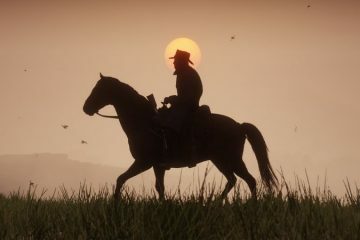 The result is a game that gives players more freedom to create and experience their own version of Arthur Morgan’s story. This means allowing for dialogue options, and making it so that the player can choose to accept or decline missions and opportunities. It also involves an honour meter that goes up when Arthur helps random strangers (who’ve maybe had their dead horse fall on them, gotten lost in the wilderness, lost their prized pony or fallen under attack), and goes down if Arthur is a murderous thief. A player’s honour then relates to how certain people will treat them in-game. Doing bad things will also leave you with a bounty, which can get quite high if murder is involved. To this point, you should always be aware of what your bounty is in each different region, if you have one at all. Reason being is that bounty hunters patrol each area, and will come after Arthur if they notice him while he’s wanted. Thus, the best thing to do is to go to a post office and pay everything off, provided that you have enough money. There’s good mission variety to be found here, too, with missions involving things like train robberies, jailbreaks, and going after targets who owe the gang money. What’s neat is that how the player chooses to go at these missions can decide how they’ll end. You can threaten, beat up or even kill people, and sometimes one is better than the other. That said, some missions also involve doing other things that don’t involve action, shootouts or danger. This could mean taking a boy fishing, or simply making dialogue choices that don’t lead to gunfire. Moving on, Red Dead Redemption II really makes you feel like part of a gang, and like you’re responsible for the wellbeing of others who aren’t as capable as Mr. Arthur Morgan. To this point, it’s important to give the gang a share of your profits, and to also bring animals that you’ve hunted and killed back for stew. You can always revisit the camp, and can take advantage of the things it has to offer, such as a bed, a shaving mirror, conversation, side missions and supplies. Speaking of hunting, it’s important to note how involved it is this time around. It is not only an essential means for which to gain food, but also helps with crafting items for later use. Things aren’t as simple as they are in other games, though, when it comes to hunting animals. Reason being is that hunting requires finding, following, killing, skinning and (often) carrying the animal. Given that your horse is the means with which you’ll carry anything you hunt over long distances, it makes sense that you’re limited to just carrying a carcass at a time for the most part. You can skin animals and store multiple pelts on the back of your ride, but after a certain point it’ll slow him down and make his stamina run out faster. This is especially true when another human being is hogtied and draped over top, or if an animal carcass has been put there for safekeeping. As with everything else in Red Dead Redemption II, the hunting process is even more realistic than ever before. First, you must try to use arrows instead of bullets in order to ensure that the pelts aren’t damaged. Downing an animal (be it a deer, bear, boar or something else) also doesn’t mean that you’ve killed it, because they sometimes remain alive and suffer like in real life; something that is hard to hear and watch. Even the skinning process is shown in detail, albeit in quicker fashion than in real life. You get to see Arthur cut the skin off, then watch as he pulls it from under the animal. Arthur can take meat from the animal, even if he can’t store the whole thing, but inventory limitations dictate how much is taken. Sometimes, all you can do is take what you can and leave the rest for other predators. There are lots of animals to hunt, including some legendary beasts. 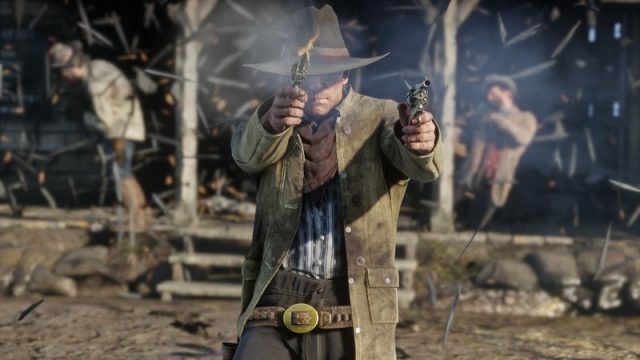 Of course, as is expected, Red Dead Redemption II also allows for first-person gameplay, which is something that was added into the current-gen ports of Grand Theft Auto V. It turns the game into something similar to a first-person shooter when shooting is involved, but it’s not as tight as some of those. I dabbled with first-person, but still prefer playing in third-person fashion, especially when it comes to shooting. It makes shootouts easier, especially when Dead Eye targeting is involved. That’s the way in which one can slow time down, highlight enemies and then resume time and quickly fire upon those targets for extra damage. Like a focus mechanic. Dead Eye has remained largely similar, and can be replenished by getting headshots, killing enemies and using health tonics. Although some tonics simply heal you (through a convoluted system that includes a health core and a health bar that goes around it, with the core relating to how quickly you’ll regenerate health), others can boost your Dead Eye which is helpful. There are multiple different types of health tonics, even snake oil, all of which have their own benefits. These can certainly be purchased in general stores, along with tobacco, hair grease, gun oil and multiple other things, but they’re easy to find while looting downed enemies. 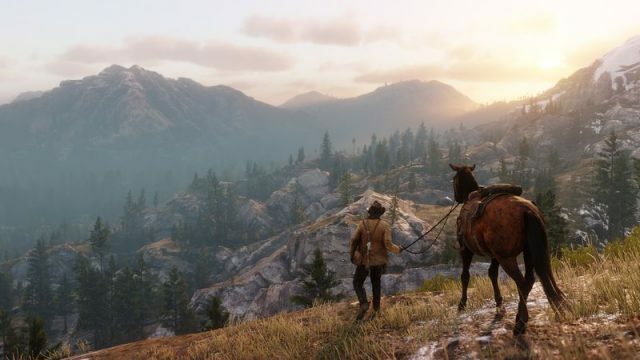 Being that this is an open world game, one can also expect side activities in addition to hunting, including drinking, fishing, five-finger roulette, dominoes, blackjack and poker. Robbing people is also an optional way to make money, although it’s often not a wise choice for obvious reasons. After all, witnesses may report the crime, bring the authorities and/or lead to you getting a bounty put on your head. 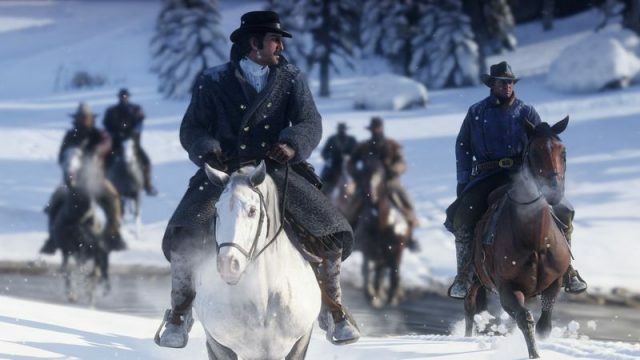 All combined, Red Dead Redemption II is a massive and lengthy game, which you won’t finish quickly. It can easily take forty hours to finish, if not more, and there exists many hours of side content to boot. It’s a stunning and impressive affair, too, albeit one that is sometimes too realistic and too metered (for lack of a better term) for its own good. The controls can also be a bit clunky, and the gunplay isn’t always as polished as it could be. Inventory management can also be a bit of a pain while under duress, but you get used to the few wheels that the game employs. Thus, this isn’t a perfect sequel, nor is it as good as it absolutely could’ve been, but even with some relatively minor issues it’s still a great experience. It’s the presentation where this game really shines, though, thanks to incredibly realistic visuals that are an absolute treat for the eyes. To say that this experience looks amazing would almost be understating things, because there’s an almost unparalleled attention to detail here. The lighting is also top notch, as is the weather, which can turn from nice to rainy in visceral fashion. Simply put, this is one of the best-looking video games ever made, if not the best, and acts as further proof that this hobby is an art form. It helps, too, that the thing runs like a dream on the Xbox One X. 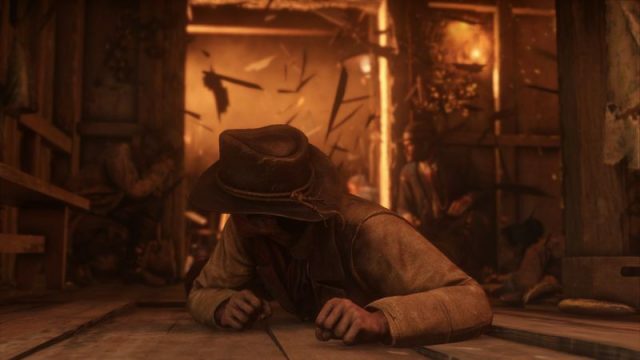 The music and sound effects also truly make the Wild West of Red Dead Redemption II feel both authentic and alive. As with the visuals, there’s an above and beyond approach to realism here, which comes not only through the strong writing, haunted characters and impressive voice acting, but also through the natural effects of the world at large. 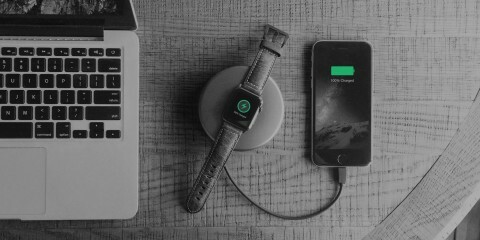 Gunfights sound great, saloons have their own quiet but unsettled atmospheres, and hunting is made even more true-t0-life thanks to some incredible sound work. This is hammered home whenever an animal falls without dying and continues to thrash and suffer. Stuff like that takes things a bit too far, though, because it makes you feel awful. Needless to say, Red Dead Redemption II is well worth your time and money, especially if you have a lot of free time to look forward to. It’s a rich, immersive, realistic and large-scale epic, which stands out for many reasons, most of all its attention to detail. 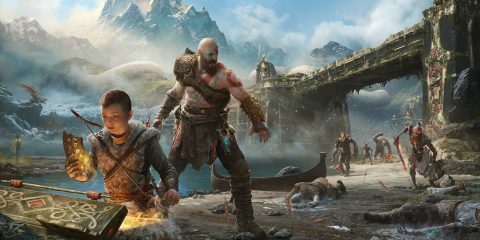 While there are aspects of the game that could’ve been better, such as tighter movement and shooting controls, they’re small detractors that you’ll eventually get used to within what is otherwise a great game. Red Dead Redemption II has some small flaws, but they don't prevent it from being a great sequel that is well worth one's time and attention.